For most musculoskeletal issues, the effects of immunosuppressants, steroids, DMARDs and protein-blocking drugs, never good to start with, usually wanes off after repeated use. And when it does, the patients realize that during the time the symptoms were being masked by these drugs, the disease was actually progressing at a steady pace. By this time though, it may already be in an advanced stage. That’s why more and more patients today are opting for natural biologics like Platelet-Rich Plasma at the earliest possible instead of waiting till all options are exhausted. This is the Self-Healing revolution. And it’s just getting started. The revolution, which some doctors call “the anabolic era of medicine,” has already eliminated the need for certain traditional methods of disease-intervention like invasive joint replacement surgeries and harmful drugs for hundreds of thousands of patients. Here are some very recent patient testimonials so you can get an idea. Catherine was diagnosed with a rotator cuff problem about 2 years ago and had trouble lifting her arm. After just two PRP injections she’s now feeling really really great. See the video below for more. George was suffering from Plantar Fascitis which was curtailing his otherwise active lifestyle. He took a year to rehab and tried a couple of other treatments before being referred to this particular doctor for PRP injections. And again, after just two PRP Injections, the pain he’s been suffering for a year was gone. This is another amazing story. Bodybuilder Greg had suffered a complete tear in his muscle and tendon – doctors told him his condition is untreatable and that he’d have to live with a physical deformation for the rest of his life. After two and a half months and zero progress, he decided to try Platelet-Rich Plasma. Within 16 days, it had healed and today his muscle is 100% back to normal and he’s doing training. Hear what he says in the video below. Although, I am not in anyway claiming that Platelet-Rich Plasma Injection works for everyone, I do believe that almost everyone with a musculoskeletal issue is an excellent candidate for it. Most physicians that we talk to (see our clients list here) say they see a success rate upwards of 80% in the chapter with PRP treatments regardless of the condition they treat. In this classic book about PRP, Dr. Bittencourt et al say, in 203 cases they studied including “38 epicondylitis, 45 Achilles tendonitis, 25 patellar tendonitis, 12 hamstring origin (ischial tuberosity) tendonitis, 08 plantar fasciitis, 08 flexor carpi ulnarii tendonitis, 07 pes anserinus tendonitis, 04 biceps femoris tendonitis, 03 iliopsoas tendonitis, 06 athletic pubalgias and 06 biceps brachii tendonitis,” they saw success rates in excess of 75%. It’s amazing how they’re utilizing PRP Injection’s therapeutic effects across the board whether its orthopedic healing, wound management, hair regeneration, facial rejuvenation or pain-reduction. NIH says PRP works by “promoting better collagen I deposition, decreased cellularity, less vascularity, and higher glycosaminoglycan content,” whatever that may mean. That’s why we’re seeing record growth in the Platelet-Rich Plasma market. It has long ceased being a fad that only a group of sports medicine specialists promote because pro-athletes like Pittsburgh Steeler wide receiver Hines Ward had used it with remarkable success. And certainly has moved beyond the realm of boutique clinics. Instead, thousands of clinics all over the nation are now offering it. It is the wave of the future, still in its early-phase of saturation. And you can be one of the pioneers in the field. Here are six reasons why you should start offering Platelet-Rich Plasma for your patients today. There would be no point in discussing a treatment if it doesn’t deliver results. You only need to look at ONE SOLID STUDY LIKE THIS to conclude its efficacy because the way Platelet-Rich Plasma works is not unique to conditions treated. Meaning, if it works for tennis elbow, chances are, it will work for achilles heel too. As well as chronic wounds, spine disc regeneration, bone healing, tendinopathy and much more. That is to say, the science behind Platelet-Rich Plasma is solid. The growth factors within platelets, mainly platelet-derived growth factor (PDGF), basic fibroblast growth factor (bFGF), transforming growth factor β (TGFβ) and vascular endothelial growth factor (VEGF) have been found again and again to be agents capable of healing tissues. PRP was initially tested by dentists in the 1990s for repair of bones after oral surgeries. Since then scores of the physicians have used it to treat the following with excellent success rates. Yes, physicians have successfully used PRP to treat these conditions for OVER A DECADE now. Yet, there are some physicians who’re only now starting to see the possibilities of this autologous healing agent. They’ve been very dismissive about it until now thanks in part due to the healthcare industry’s lackadaisical approach to it. Fortunately, much of that is changing. The future is looking bright for Platelet-Rich Plasma. A quick search in clinical trials database reveals 101 clinical trials at the time of this writing. And it has now become a powerful force in modern medicine. Preparation of Platelet-Rich Plasma is a procedure that puts the latest high-technology protein-blocking drugs to shame (more on that later) in every sense. Prepared using a simple desktop centrifuge in about 10 minutes (not including the time to draw blood), PRP delivers more therapeutic benefits than many other billion dollar drugs used for the same purpose. The entire procedure takes a maximum of 45 minutes and patients can return to their usual daily routine immediately. Plus the produced PRP is capable of remaining sterile and viable for a couple of hours. And the safety record? Excellent, in all its use cases. Platelet-Rich Plasma acts on the body in the most natural way you can think of – by triggering a healing cascade consisting of hemostasis, inflammation and proliferation phases. This is the way our bodies are designed to heal. It doesn’t aggravate the disease by blocking the natural function of cells, which is what almost all other drugs are designed to do. Therefore the earlier your patients have Platelet-Rich Plasma injections, the less likely that things will get complicated enough to warrant a surgery. We’ve heard from doctors again and again that their patients who were prescribed surgery ended up not having surgery for years. Platelet-Rich Plasma can actually regenerate tissues, muscles, ligaments and even bones. It works like stem cells but with little less dramatic results and none of the side-effects that stem cell treatments are notorious for. Here’s what one of the doctors had to say. One of the biggest reasons why physicians don’t start offering Platelet-Rich Plasma sooner is that they mistakenly think that PRP is just a fad and it might vanish entirely a few years later. But the fact is, the biologic era of medicine is here. And Platelet-Rich Plasma is leading it. And in coming years, putting together joints and discs using steel may look primitive as more scientific data emerge in favor of Platelet-Rich Plasma. Some experts suggest that injection therapies may replace up to 70% to 80% of the surgeries in the near future. In other words, this shift in treatment paradigm is big. The earlier you get in, the more expertise you gain. There is a reason why some doctors get amazing results with PRP while others struggle to make it work. The reason is clear. The ones that make it work have a thorough understanding of the science behind it, and are confident about the limits and potential of the treatment. In this case, there is no substitute for experience. The sooner you start doing them, the more confident you become in PRP injection therapy. Don’t wait. One of the biggest drawbacks blocking the stem cell treatments from going mainstream is the potential for the treatments to go horribly wrong. Since Platelet-Rich Plasma acts on cells via transmembrane signal cascades and doesn’t modulate the cells and their functions, there can potentially be no harmful effects from using it. That’s why you DON’T NEED FDA approval to start offering Platelet-Rich Plasma treatments. It also means that aside from occasional patient dissatisfaction with PRP – could happen in less than 10% of the cases – there is nothing else you need to worry about. No further complications, regulatory actions, or lawsuits can arise. If it doesn’t work, fine. You can try some other treatments. Or you can even combine it with other injection treatments, provided the combination does’t negate the effects of PRP – we’re seeing a trend towards that as evidenced by this study where the therapeutic effects were doubled when PRP was added to the treatment. That’s why your decision to start offering PRP is going to be an easy one. As I mentioned earlier, a very low investment in a simple desktop centrifuge like this and the PRP Kit will get you up and going with PRP injection treatments. And you don’t have to worry about stocking up on expensive drugs or other raw materials. Your cost of goods sold is very low. That can translate to lower costs for the patient. But, I’m not suggesting that it will be all a smooth ride with Platelet-Rich Plasma. One of the challenges you may face is generating standardized protocols for different patient use cases. This can take a while due to trial and error – a fact evident in the current literature, where different studies follow slightly different protocols resulting in varied outcome. So you have to use your expertise in developing protocols to maximize your results. Some factors that may come into play are the activation method, presence of red blood cells, number of spins in centrifuge, proficiency in ultrasonic image guidance, number of leukocytes and photo-activation of PRP. You may also have to test things like Platelet-Rich Fibrin Matrix depending on your therapeutic needs. Dr. Gregory Lutz is one of the early pioneers in Platelet-Rich Plasma – he is the author of a prospective, double-blind, randomized controlled study on lumbar intradiskal PRP injections. And here in the video below, Dr. Lutz discusses his experience and provides case examples for PRP treatments. This past May(2017), the FDA approved a drug known as Kevzara – an interleukin-6 receptor (IL-6R) blocker. According to the reports, this drug costs patients (or their insurance providers) $39,000 a year and is expected to generate upwards of $1 billion in revenue for the licensing company by the year 2023. This is a drug that offers at best a temporary 66% improvement in signs and symptoms when using with another DMARD – and carries a risk of producing serious immunological disorders as the drug affects the immune system. Now, in contrast, the autologous, non-immunogenic Platelet-Rich Plasma needs only a couple of injections that has no side effects – all of it produced from a little desktop centrifuge at your local office. No patent licensing fees involved. Sure, the patient has to pay a couple hundred bucks out of pocket, but which one do you think an informed patient will choose? 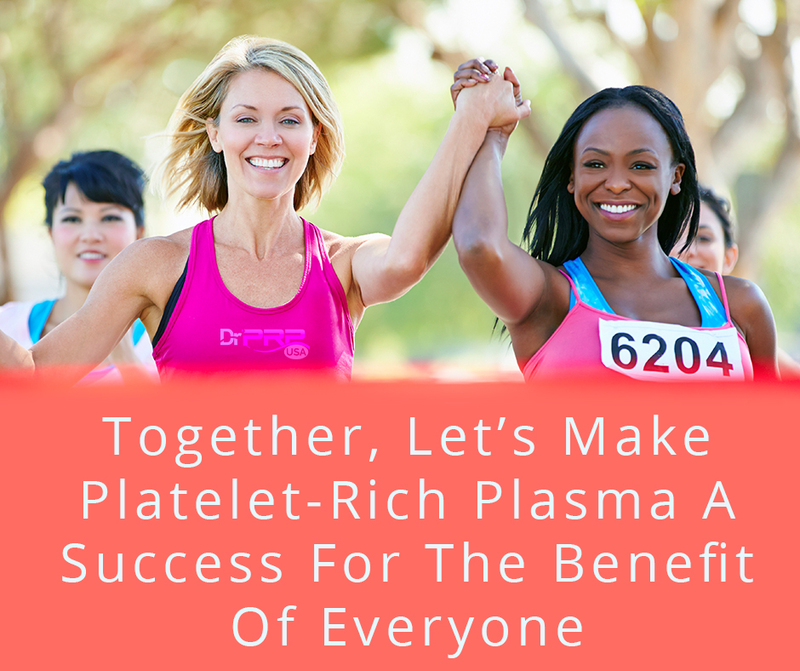 Come join the revolution by getting started with Platelet-Rich Plasma. Click here or call us at (844) 377-7787 to talk to us. We’ll support you in the setup and marketing of PRP. While there are thousands of skincare centers nationwide offering at least one PRP treatment for their customers, most of them doesn’t go beyond the PRP Micro-needling treatment popularized by Kim Kardashian. The reason is – it is the simplest of all Platelet-Rich Plasma aesthetic treatments around and also the most sought-after treatment. This is all good until they realize the immense potential of PRP treatments. What they’re missing out on is the fact that once you’ve made the investment for Platelet-Rich Plasma which includes a centrifuge, PRP kits and staff training, they can start offering a whole suite of treatments for their clients. That applies to skincare as well. The Platelet-Rich Plasma you obtain from your clients can be used for a number of treatments, the demand for which are only growing. Here are a few ideas – these are probably the most popular/cutting-edge PRP treatments performed by dermatologists and plastic surgeons. The topical application of Platelet-Rich Plasma with Micro-needling can help regenerate the degrading skin cells and promote collagen production to keep skin plump and supple. This basic process may be enough for some of your clients. But those who’re looking for more than just skin rejuvenation, you may have to go deeper. To augment the face with natural, feminine volume, you’re going to have to inject Platelet-Rich Plasma deeper into the dermis. This will supply the growth factors to the degraded dermal tissues under the surface. For volume though, you’ll need a filler. You can either go for a Platelet-Poor Plasma (PPP) based filler (PPP is the left-over from the Platelet-Rich Plasma process – you can read about the process in detail here.) or you can use any Hyaluronic Acid filler like Restylane Lyft. This combination injection treatment has been proven to work well. One study by Dr. Daniel Sister analyzes the effect of a combination of platelet rich plasma, hyaluronic acid, and succinic acid for facial augmentation. The treatment showed 100% success rate. The combination treatment seems to be evolving into a new standard in facial augmentation. It’s definitely seeing growing demand. Companies spend millions of dollars on research to turn defective cells healthy and to increase the skin’s collagen production. They are looking into DNA technology to pull this off. But adding Platelet-Rich Plasma to existing treatment methods may be a simple and effective way to achieve the same results. Scientists from Cairo, Egypt had recently proven that adding PRP injections to fractional CO2 laser treatment for correcting vitiligo can boost the results by 4X compared to just using the laser alone. This is great news because given that CO2 laser can also be used to treat facial wrinkles, age spots, and acne scars, it seems we can significantly boost the results by combining it with PRP injections. And if PRP is capable of boosting the effects of CO2 lasers, chances are, it can do the same for some of the other facial resurfacing treatments that you already offer your clients. Isn’t that an amazing opportunity… to offer the same treatments you’ve been administering for years – but only this time it’s significantly more effective with a secret biologic hack? Hundreds of skincare clinics are just doing that. It’s time to get on the bandwagon and start surprising your clients. As one of our friend-clinic owner says, PRP treatments have been a big boon to the business (PRP treatment has a 100% “worth it” rating on real self) as even people who’d had total skin resurfacing have responded well with it. Mesotherapy is a well-known treatment that uses painless micro-injections for delivering active ingredients evenly to skin surface. This novel procedure has a reputation for improving the quality results obtained by traditional skin rejuvenation substances like vitamins and peptides. And as many skincare clinics have discovered, there could never have been a more synergistic technology than this for Platelet-Rich Plasma. The Meso Gun, as we call it, can be used to deliver an even amount of Platelet-Rich Plasma to the face, neck, chest, and hands for rejuvenation and reduction of wrinkles and discoloration, to thighs and tummy for treatment of cellulite and stretch marks, and to the scalp for the treatment of hair loss. The big winner from this pairing of technologies is the hair loss treatment. Platelet-Rich Plasma when administered on the scalp using Mesotherapy works as an “elixir for hair growth” – and here’s a recent peer-reviewed study on Stemcell investigation journal that confirms this. Hair loss treatment is one of the examples where PRP treatment has exceeded the expectations set by the industry. That’s why we believe this is one of the treatments that every skincare clinic should offer. Hair-loss and thinning of hair affects both men and women and is one of the most popular cause of worry for your clients. It complements the skincare treatments you offer and you’ll see many of your clients thanking you for that. Contact us at (844) 377-7787 for more information on the Mesotherapy gun. Some of these treatments are so new – you may have never heard of them before. And that’s a sign that you should offer them immediately. If you have joined the Platelet-Rich Plasma bandwagon, it’s only intuitive to expand your offerings from just a PRP-micro-needling treatment to these in-demand procedures. You can do this with very little changes, if any, to your existing Platelet-Rich Plasma setup. And chances are they will pair well with other treatments you offer whether it’s Kybella injections, Photo laser treatments or dermal fillers. And if you aren’t offering Platelet-Rich Plasma yet, this post illustrates a whole lot of reasons why you should be. The demand is only getting stronger. The earlier you join, the more you’re likely to prosper from this incredible breakthrough of modern medical science. Are You Maximizing Your Clinic’s Potential With PRP? If you’re getting started right now, give us a call at (844) 377-7787 or head on to our shop to setup your clinic with the right things for Platelet-Rich Plasma. Our proprietary PRP kit makes the Platelet-Rich Plasma extraction process super efficient and produces high quality PRP in far less time than it would take otherwise. You can read more about our PRP Kits here. Platelet-Rich Plasma is the blockchain of self-healing and it’s here to stay. It will become best friends with almost every aging man and woman either through their need to reverse aging effects or the need to heal musculoskeletal issues. And both group of people will start putting trust in it once they’ve had a chance to try it. That’s why demand for PRP has skyrocketed organically – without the big pharma advertising dollars – over the past few years. The question is, are you willing to seize its potential? According to the famous sports medicine expert, Brian J. Cole, M.D., M.B.A., a good orthopedic surgeon is one who works hard to prevent his/her patients from going under the scalpel. To this end, he advocates a lot of contemporary thinking and treatments like Platelet-Rich Plasma rather than the usual MRI-driven surgical procedures. And we’re seeing more and more orthopedic surgeons who are following the cues of the people like Dr. Cole and are genuinely astounded by the sheer number of surgeries they could avoid by a little poking around with alternative treatments. A Little Late to The Regenerative Game? And no doubt, one of the key treatment options in Orthopedics that ends up actually saving a lot of patients from going under the knife (and has since become a powerful force in medicine) is Platelet-Rich Plasma. Of course, we’re biased but there is probably no other medical discovery in the modern medical history that has as much an impact on the medical industry as Platelet-Rich Plasma. Physicians now prescribe it as first-line treatment for a variety of medical conditions. And although Plastic surgeons are leading the way in pioneering its application, we believe the nature of PRP is such that it will eventually be of massive benefit in Orthopedics than any other field. Another reason is runners. They constitute a good portion of the orthopedic surgeon’s patients. These patients do not have life-threateningly serious conditions. They might have minor pain or discomfort that prevents them from enjoying their daily run. They just want to be able to run again. The great news is, a single shot of Platelet-Rich Plasma can do wonders for them. Although few physicians question the efficacy of Platelet-Rich Plasma for joint diseases like knee arthritis, there are well-meaning physicians who resist recommending it to their patients lest they end up wasting the patient’s money. We regularly receive enquiries from such physicians asking for “hard evidence” of PRP’s efficacy. We know that skepticism is natural. And that’s why we’re doing our best to educate physicians so they can come to their own conclusion about Platelet-Rich Plasma. The truth is there has been more evidence than we can handle. Platelet-Rich Plasma is huge in arthritis. Earlier this year, researchers from Shanghai, China published a review of the 14 existing randomized controlled trials related to PRP treatment of knee-OA that comprised a total of 1423 participants. And they concluded that Platelet-Rich Plasma could be more efficacious than HA, ozone, and corticosteroids in terms of pain relief and functional improvement at 3, 6 and 12 months follow-up. This justifies why some physicians are confident enough to use PRP injections as first-line treatments for all osteoarthritis cases. And just recently, Spanish researchers took the next step. They tested an advanced method of Platelet-Rich Plasma infiltration for treating severe hip osteoarthritis and found that the technique extended the distribution of PRP and improved its efficacy. Simultaneously, another Spanish study established that a single PRP injection can be effective in treating late-stage knee OA. This is really really great news. Because if you’re physician dealing with arthritis patients, you probably have never seen any treatment that is this simple which has long-term therapeutic effects like that. However, on the standardization of the PRP treatment itself, there has been no major progress except that most of the research agrees that a concentration of 1,000,000 platelets per µl (or 5X-7X above baseline) is required for therapeutic effect. This can be obtained through buffy-coat based double-spin process similar to the one followed by Dr. PRP Kits. Some researchers have suggested using Leukocyte-poor PRP for Osteoarthritis but there isn’t enough evidence to support the notion that having less leukocytes enhances OA treatment results. In fact, there are some RCTs like this that used leucocyte-poor PRP that have failed to produce significant results while leukocyte-rich PRP had a beneficial effect as evidenced by this study. Bone regeneration is a little-known field of medicine where Platelet-Rich Plasma has been quietly performing well. In a 2014 study, researchers concluded that there is little doubt that PRP can be beneficial for bone regeneration. But the mechanism through which PRP was able to achieve this is still largely unknown. Recently, researchers in Japan has discovered that a combination of Bone Marrow Stem Cells and PRP appeared to enhance bone formation in mice. Another RCT by Iranian researchers suggested using PRP along with autologous bone graft for long bone non-union fractures. Platelet-Rich Plasma has also been compared with bone marrow aspirate (BMAC) concentrate by Japanese researchers and they found that PRP has almost the same capability for bone regeneration as BMAC. This is significant considering the simplicity of PRP extraction vs BMAC extraction. There is another meta-analysis by Korean researchers that looked at the effect of Platelet-Rich Plasma on Sinus Bone Graft. Again, the study concluded by saying PRP is beneficial. Historically, tendons are known to respond well to Platelet-Rich Plasma. And this review of current literature confirms the fact. This review also concluded that Leukocyte-Rich PRP (the normal PRP) was more ideal for intratendinous injections. Platelet-Rich Plasma also has a long history with tennis elbow and Rotator cuff injuries. Researchers in China looked at 8 randomized controlled trials (RCTs) that involved 511 patients with tennis elbow and came to the conclusion that PRP is a more ideal treatment than steroids. But PRP’s relationship with Rotator cuff injuries suffered a setback last year when a Chinese review concluded that PRP is not beneficial. Prior to that, AAOS had reported that it might be beneficial. Intervertebral disc degeneration is one of the leading causes of lower back pain and is usually the one of the most expensive conditions to be treated – mainly due to the complexity of the condition. In one case we know, a patient with degenerative disc condition in both his lumbar and cervical spine – he had both a degenerative bulging disc at L4 and a sacroiliac joint dysfunction – was still pain-free 2 years after his doctor administered 2 PRP injections. But for this post, let’s put anecdotes aside and look at latest studies like this by Chinese researchers which seems to support the notion that PRP is indeed beneficial for retarding intervertebral disc degeneration. Another study by researchers in New York also found that PRP is beneficial in the treatment of degenerative intervertebral discs. What we’ve presented here is only a fraction of the literature available. As you can see, this is an interesting time of development for Platelet-Rich Plasma. It continues to be of great interest to medical researchers and the patient population. Though the scientific community is torn apart by the lack of standardization and “hard evidence” for PRP treatments, patients are showing huge interest in it even though they have to pay out-of-pocket for these injections. And the reason why patients are voting with their wallets for this treatment is because 1) it’s simple and highly practical and 2) lot of anecdotal evidence. The research community is trying hard to catch up to these patients’ belief – there are currently over 100 active clinical trials on Platelet-Rich Plasma – and we believe it’s only a matter of time before they succeed in their quest. The lack of funding is only major hurdle the research community has to overcome before they uncover the full therapeutic effects of Platelet-Rich Plasma. And we’re excited and so should you because it’s great news for your patients. But for now, there’s plenty of evidence to suggest that Platelet-Rich Plasma treatments can be a standard regimen for treatment of musculoskeletal disorders. In the coming years, you will see more standardization in PRP preparation, concentration, pre-activation, injection volume, injection frequency and post-injection protocols. One other thing to keep in mind, when weighing on the pros and cons of offering Platelet-Rich Plasma to your patients is the cost-effectiveness. Yes, you may not want to waste your patient’s money. But Platelet-Rich Plasma is something that has enormous upside with a relatively low downside. This is especially true when compared to surgical intervention. Average cost of the highly invasive arthroscopic debridement, for example, is $5000. But the same results may be obtained by 3 shots of PRP that costs $1000. The amount of improvement reported by patients undergoing both is similar – about 50%. That’s $20 for every percentage point improvement vs $100 for every percentage improvement in the case of arthroscopy. Even if the patients have to pay out-of-pocket for PRP injections, that’s not a good reason why they should not try Platelet-Rich Plasma. Check out our Platelet-Rich Plasma kits here.